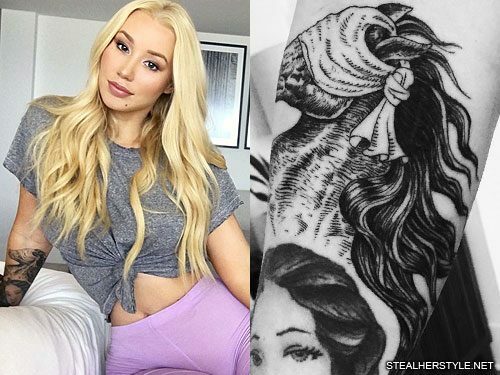 Iggy Azalea got a tattoo of a blindfolded horse on her right forearm in July 2016. Artist Sean Smith used etching lines to create the illusion of shading. A dark area of the horse’s mane covers her old number “1” tattoo, while the long and flowing mane follows the curves of her existing Venus tattoo. 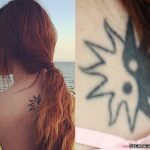 The was the first of a series of tattoos which she got within the span of a few months to convert this arm into a half-sleeve. The Venus tattoo stayed but she eventually covered up her old “Trust Your Struggle” tattoo. The blindfold on the tattoo could have a few meanings, including keeping calm in the face of danger and blind trust. The most common reason that owners put a blindfold on a horse is to keep it from becoming frightened. 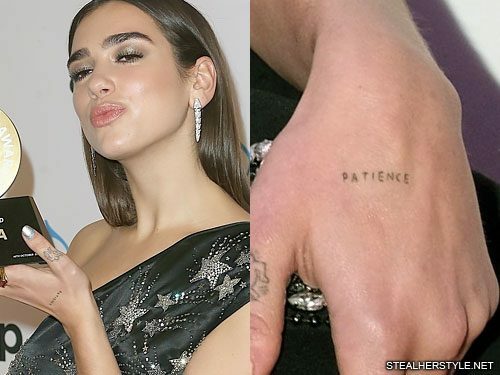 Dua Lipa first showed off the “PATIENCE” tattoo on her left hand in an April 2017 instagram photo, writing “Patience is key.” In an interview she explained that the tattoo is a constant reminder for her to stay calm and be patient. Kiersey Clemons has a tattoo between her breasts on the center of her chest. 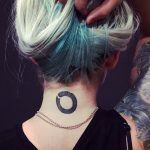 It is the symbol for the heart chakra, known as “Anahata,” which represents calm and serenity. 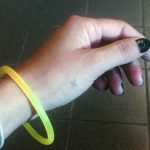 Shanae Grimes has a Japanese character tattoo on the inside of her right wrist. 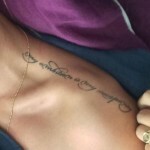 It means “Keep Calm” and was inspired by the time that she spent in Japan.